Friends and relatives may bring along their dogs to pay a new year call during the festive season, this is also a good chance for the dogs to make new friends, so seize the opportunity. But your dog might get nervous when it sees unknown dogs and couldn’t keep its usual tameness, cuteness and politeness, and would even get noisy with the other dogs. This kind of emotional temper could be caused by stress and tension. How to keep the dogs harmonious when everyone gets together? First of all, pet owners can try to readjust the sensitive emotion of their dogs when met by other unknown dogs. Bring them out for an after-meal walk more often, so they could meet with more people and play with other dogs. Pet owners need to be by their side to give them a sense of security which in turn will lessen their stress. If pet owners find their dogs suddenly turn uneasy and unsettling, they need to intervene and appease them. Over time, they would not be hostile towards new faces and they might perhaps even turn into social butterflies. Pet owners can first sooth and calm down the dogs when being in contact with unknown humans or unknown dogs, then followed by verbal praise, gentle touch or food reward to associate the encounters with happiness, and these are good ways for encouragement. Repeat these measures to deepen impression, condition the dog with a good association to slowly reduce violent behavior. 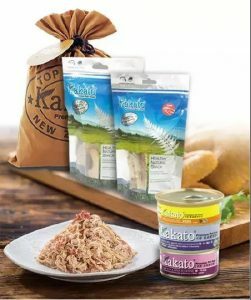 Kakato is a New Zealand brand of Premium Pet Food, all rounded nutritious and delicious, provides your pets with dried food, healthy snacks and up to 26 flavors of tinned wet food. Kakato chooses meat from free-range livestock and fish from natural open water, free of hormone and disease, and are made to human grade. They are suitable not only for daily consumption, but also good as a snack for encouragement.